We set up a camera and did a time lapse capture of setting up a show and all that’s involved. From turning up at 8am to set up for a 10.30am start to show close at 4.30pm to leaving the building about two hours later – this film should give you a little insight into the effort involved in getting a stall set up from a blank space, to the show in full swing and back to empty again. We will be coming to ‘The Big London Flea’ for the first time – held in Dalston’s former ABC cinema, The Big London Flea is North London’s largest indoor vintage market. We will join over 50 hand-picked vintage traders selling an amazing mix of salvaged, one-of-a–kind, lost and found objects, and handmade items, that include, 20th Century furniture, vintage clothes, curiosities & collectables, kitchenware, reclaimed industrial fixtures / electrical, and unexpected oddities. We are back at the longest established furniture flea and our favourite fair – The North London Furniture Flea, York Hall, Bethnal Green. We will be in our usual spot (the noisy ones in the corner) Door open at 10.30 for this fabulous furniture event. We are pleased to be attending the AFE Art, Antiques & Interiors Fair – a new vibrant fair organised by the ‘Antiques for Everyone’ team. Being held at the ExCel centre in London Docklands this fair will have 150 dealers and we will be there too! We will be bringing a great selection of our vintage Bluetooth speakers – which would look great in Art Deco to Mid-century Modern interiors. We will also have radiograms, record players and a selection of vintage glass and Fat Lava ceramics. We will be in The Vintage Marketplace, selling our wares including record players, speakers, phones and homewares; there will also be lots more from other traders including ladies fashion & menswear, vintage jewellery, mid century modern homewares, records, music memorabilia and up-cycled ephemera. Bring cash! You’re gonna need it…but don’t panic we take credit cards so you can shop till you drop; plus we will look after your purchases until the marketplace closes to save you carrying them around. So come to the Dock for a fab weekend, the fun starts at 11am both days and the weather is looking pretty good too! We have taken delivery of our new van, which we have named ‘Boris’ (named before all the shenanigans). He is MUCH bigger than Ruby so we will be able to bring more fab stock to all the shows we are attending; this includes the upcoming Furniture Flea at York Hall, Bethnal Green. 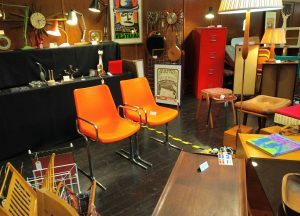 As this is the first and oldest furniture flea, it has a special place in our heart as we have been there from the start. 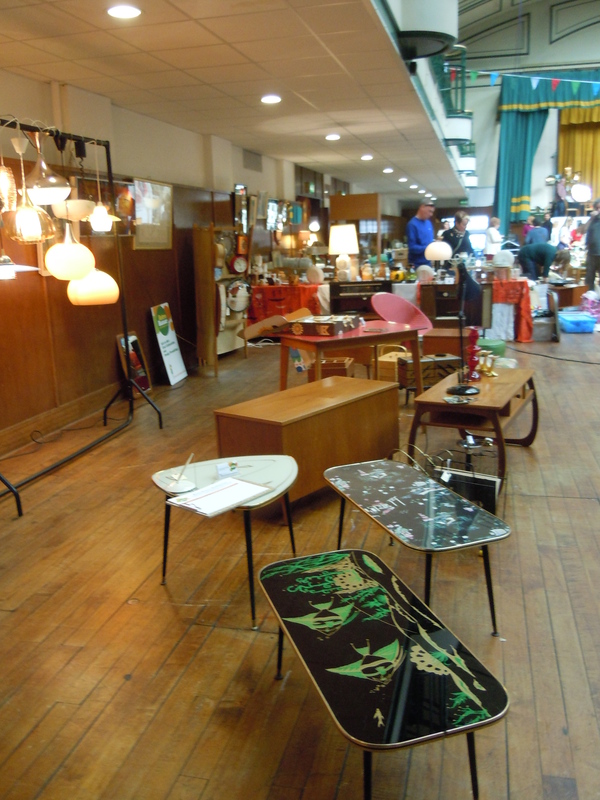 We love this event – its vibrant, fun, full of fabulous vintage, retro and mid-century stock and always madly busy. We will be bringing a fabulous mixture of our vintage technology – after a quiet few weeks on the show front we have amassed a great selection of newly restored and serviced radiograms, radios, speakers, dial telephones, and some gorgeous lighting, including some amazing Holmegaard pieces. So see you all there Sunday 3rd July, 10.30 till 4.30. PS: Needless to say Ruby has not been sent to the great scrapheap in the sky, she has been retired and is looking for a new home – miles of use left in her yet! Roll up Roll up for the Furniture Flea Weekender! The fabulous South London Furniture Flea is coming to Clapham for a two day vintage extravaganza on Saturday 16th & Sunday 17th April. We will be bringing our usual selection of vintage and retro audio, including reworked MP3 compatible speakers, radiograms (all serviced and ready to go) plus genuine vintage portable record players. We’ll also have a host of furniture, lighting and small accessories to adorn your home. So grab yourself a piece of vintage glass, a classic dial telephone or a stylish Starburst Wall Clock. We’ll have different stock items each day as we will be replenishing over night – Poor Ruby the van can’t hold everything! We and a couple of other regular traders will be there the whole weekend, also there will be a mix of different traders each day which will give you a chance to look and buy a huge selection of great affordable bits & pieces for your home.